Mt. Kuju, one of the 100 best mountains in Japan, and Mt.Taisen ,which are higher than 1700m. to the two wetlands such as Tadewara and Bogatsuru which are registered under the Ramsar Convention. This whole area is designated Aso-Kuju National Park. the nature and culture in Kuju area in Aso-Kuju National Park. You can ask questions in English about nature, how to get around, hiking routes and so on. We are also very happy if you share your experience in the mountains with us! There are some footpaths in Tadewara. (20min.to 1hr.) Ask the details at the information desk. Kuju Fan Club is a unique organization, consisting of national and private bodies and also a nature conservation group. monitoring research on the plants in Tadewara, eliminating the alien species and others. and mini lectures on Aso-Kuju National Park. 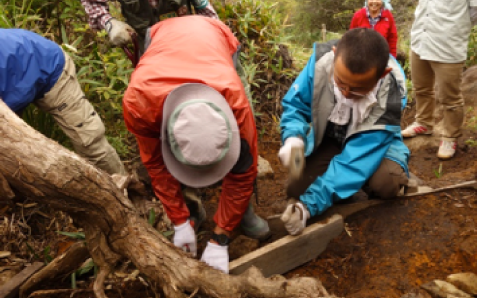 We arrange nature observation walks in Tadewara. Through our facebook, we send information about the hikes and trails, and also the beautiful scenery from Kuju mountain range. repairing of the signposts have been done in cooperation with various groups. To keep surrounding area tidy, the staffs keep an eye on the area, including the public toilets and parking area.